Today we’re reviewing the best ultrasonic toothbrush on the market. Ultrasonic toothbrushes are known for their high-powered brushing ability. These toothbrushes use high frequency brushing to get far more strokes in to brush away plaque and residue than you can when brushing for the same amount of time by hand. These brushes just like industry leaders Sonicare and Oral B, ultrasonic brushes are engineered to deal with the plaque and blast away bacteria so that your teeth are getting consistently cleaned. The first-ever ultrasonic toothbrush was patented in 1992 and approved for daily home use in the same year, and brushing has given people two very different choices ever since; manual or automatic, in a sense. One uses batteries or a cord to deliver its brushing and the other one you just have to use good-old fashioned human power. They are considered to be some of the best electric toothbrushes in oral care because they are capable of delivering more brush strokes than the human hand can generate, that is for sure. There is the sonic and then the ultrasonic version of toothbrushes too, Sonic brushes create sound vibrations that can be heard, while ultrasonic brushes use electronic ultrasonic waves to allow the brush to oscillate 40,000 times a minute on average compared to 12,000 to 24,000 waves made by sonic brushes. So, where should you be looking for your next ultrasonic brush and what are the best features to capitalize on when shopping for one? 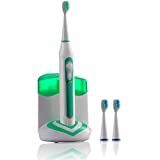 Check out our reviews of 5 best ultrasonic toothbrush 2018 in the USA market. It safe to use on sensitive teeth, gums and implants because much of the cleaning is done by high frequency air oscillations without much cleaning. A sonic brush features a design where the bristles of the toothbrush move back and forth at really high speeds. This is helpful in removing the plaque by scrubbing it proficiently. A typical sonic vibrates at a high frequency of around 260Hz which roughly 31000 brush strokes per minute. So, a sonic brush vibrates at a higher speed even than a normal electric brush. The parts in a sonic toothbrush consist of an electric motor with a vibrating head. This is possible due to a vibrating element attached to the motor. Besides that, the body contains a circuit board that controls the: timer, speed, and power buttons. The oscillating head also contains a spring action that helps vibrate the bristles back and forth at really high speeds. This way, only the bristles vibrate while the rest of the body stays stationary. This ensures that it cleans at really high vibrating speeds. A sonic operates through two different types of modes for cleaning the teeth: Scrubbing through mechanical action; this is the normal method of cleaning and can be seen in regular toothbrushes as well. The bristles scrub the teeth surface cleaning the plaque. Better cleaning action here depends on how well a user is able to use the brush. Multiple vibrations, or strokes per minute involved, are also the key aspect behind it. That is why; a sonic toothbrush is able to offer better cleaning due to its high vibrating speeds. Dynamics related to fluids: In this mechanism, the high vibration speeds developed in a sonic make the bristles to mix fluids surrounding the teeth (saliva) of a user to an extent that it is able to disorganize the plaque on the teeth. This partly answers the question How Do Sonic Toothbrushes Work? The mechanism has a lot to do with pressure waves that exert gentle pressure which removes plaque colonies from the teeth. The agitation process is carried out at really high speeds, which creates bubbles in the mouth. This further helps in escalating the removal process. However, there is no actual contact involved between the sonic brush’s bristles and the teeth surface due to the fluid dynamics involved. There is a minute gap between the two surfaces as a layer of fluid is between them working on removing the plaque from the teeth. This also helps to make sure that the sonic speeds do not damage the teeth surface due to rigorous brushing. When it comes to ultrasonic toothbrushes, using them over manual toothbrushes or not brushing at all is a definite improvement. If you want to invest in ultrasonic brushes for your oral health, the above models offer a few great choices to choose from. Perhaps you want firmer bristles or the most waves a second for the ultimate clean. Either way, the ability to fight plaque and build up of these types of toothbrushes is just incredible. They are able to act against bacteria and to scrub them away, even breaking up the plaque that is under the gum surface. With plaque under the surface of the gums, the gums get irritated and inflamed. This can lead to infection of the gums and worse problems, so it pays to get an ultrasonic toothbrush and not only prevent plaque and tartar buildup but address the buildup that is already there. The rapid action vibrations of these brushes are designed to get rid of bacteria and plaque as well as any debris that is in or against the teeth and gums. When not brushed away, that debris stays and creates a breeding ground for all of the bacteria that want to come feed on whatever’s there. Breaking up the cycle and removing that playground for bacteria is why the ultrasonic waves are so effective– and so desired. Easier to use than manual brushes, the vibrations being generated by the brush take care of everything and offer superior tooth and gum care. Even at high frequencies, these brushes do not irritate the gums, key to maintaining oral health. Just because it’s intense does not mean it’s good for your gums or teeth. The ultrasound tech involved in the brush has been tested to be certified to be safe for use. While all of these brushes are amazing, the Smilex AU-300E is a great brush, as is the Oral-clean Sonic Electric Toothbrush with 2 Bristles. The Smilex offers you a huge reduction of plaque with 97% reduction on first use and a whopping 96 million vibrations a minute. With instant relief from bleeding and gingivitis, this brush has it going on, as does the Oral-clean Sonic toothbrush. With 40,000 strokes a minute and three modes of use with super effective plaque removal, this model is where it’s at. Bottom Line They’re all great, it just depends on what you’re looking for. If you can’t decide as to which is the best ultrasonic electric toothbrush to buy, the Oral-clean Sonio and the Smilex AU-300E. The Original Ultrasonic Electric Toothbrush – Brush With The Power Of Ultrasound are good bets. Oral B vs Sonicare – Which is Better?